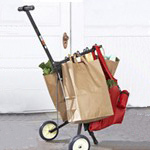 The basket on this cart will easily hold a large grocery bag; and the handle is covered with a plastic grip which makes it easier to hold and push. The basket dimensions are: 10.25" deep; 13.5" wide and 20.5" high. The wheels are 3" in diameter for the front; and 6" in diameter for the rear wheels. The wheels are solid rubber with steel spokes. 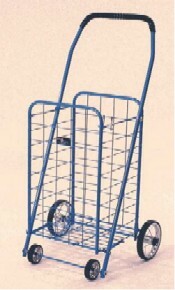 The overall height of the cart is 36.25" tall from floor to handle. 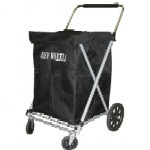 Folds flat for easy storage. Available in your choice of Red, Blue, Black, or White.